WASHINGTON, DC, March 4, 2010 (ENS) – A proposal to ban all international commercial trade of Atlantic bluefin tuna at this month’s meeting of the Convention on International Trade in Endangered Species, CITES, has the support of the United States, a senior U.S. fisheries official said Wednesday. “The United States continues to have serious concerns about the long-term viability of either the fish or the fishery,” said Tom Strickland, assistant secretary of the interior for fish and wildlife and parks, who will head the U.S. delegation to the upcoming Conference of Parties of the 175-nation treaty in Doha, Qatar. The Atlantic bluefin tuna is highly prized, especially for high-end sushi and sashimi, and a single fish can sell for tens of thousands of dollars. 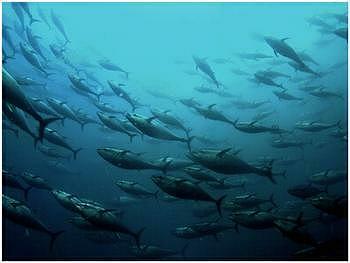 The Eastern Atlantic and Mediterranean bluefin population has declined more than 80 percent since 1970. 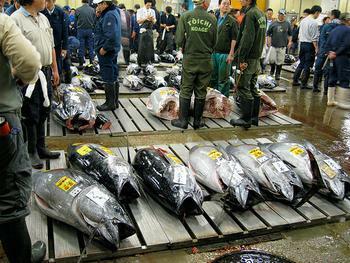 Bluefin are threatened by overharvesting, which includes illegal, unregulated, and unreported fishing. If adopted at the CITES meeting, the proposal by Monaco would place Atlantic bluefin on Appendix I of the treaty, under which commercial trade in the species is not allowed. Non-commercial trade would be allowed by permit only. Strickland initially announced support for the Monaco’s CITES proposal last October, but left open the possibility that the United States could change its position if the International Commission for the Conservation of Atlantic Tunas, ICCAT, strengthened management and compliance measures during its November 2009 meeting. “We recognize that the parties to ICCAT took some unprecedented steps,” said Strickland. But, he said, the 2010 bluefin quota level adopted by ICCAT is not as low as the United States believes is needed, and he also pointed to “serious compliance problems” with international bluefin tuna conservation measures. “We understand the frustration of our U.S. fishermen who have followed the scientific recommendations and regulatory provisions of ICCAT for many years while their counterparts in the eastern Atlantic and Mediterranean have often overfished and engaged in ineffective management,” Strickland said. Conservation groups welcome the U.S. position. “The U.S. has a vested interest in this issue, as a fishing nation of Atlantic bluefin tuna – so if the U.S. can see the bigger picture and back the international trade ban proposal for the long-term survival of a species and a fishery, all countries can and should do so,” said WWF tuna expert Dr. Sergi Tudela. The European Commission declared its support for a ban in February but wants any ban to be delayed for 12 months to wait for more scientific information to assess the adequacy of any measures adopted by ICCAT when it meets in November 2010. The United States is not asking for any conditions or delays of the ban, unlike France and the European Commission. The Atlantic bluefin tuna is subject to a massive international trade, including a high incidence of illegal trade of the East Atlantic and Mediterranean stock, and ICCAT has the statistics to prove it. 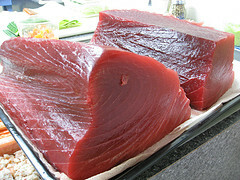 Japan, the main consumer of Atlantic bluefin tuna, reported to ICCAT the import of 32,356 tonnes of processed Atlantic bluefin for 2007. By contrast, ICCAT set the legal quota of 29,500 tonnes for that year. And ICCAT estimated real catches of Atlantic bluefin tuna in 2007 potentially reaching 61,000 tonnes. The maximum annual catch recommended by ICCAT’s Standing Committee on Research and Statistics to prevent collapse and initiate rebuilding for that bluefin stock, is estimated at between 8,500 and 15,000 tonnes. Today, bluefin tuna are literally being eaten out of existence, but if CITES Parties approve the Appendix I listing, Atlantic bluefin will disappear from most sushi plates. That would be just fine with a growing number of celebrities who might otherwise order bluefin tuna sushi, served on rice, or sashimi, which is the raw fish served in thin slices without rice. A statement in support of the bluefin tuna ban has been signed by actors Michael Douglas and Ted Danson; model Elle MacPherson; former UN Secretary-General Kofi Annan; European diplomat and politician Javier Solana; and 46 other public figures. Supporting groups include: Greenpeace, Madrid-based Ecologistas en Accion, Latin American regional NGO MarViva, Oceana, and The Pew Environment Group.